Veterinary practice owners and managers are becoming increasingly aware of the power of mobile technology, which is a great thing. There’s no doubt that the explosion of smartphone technology has created a tremendous opportunity to provide value to clients year-round, not just when they’re in the office. A couple of these tools have been around for a while, though I probably shouldn’t call them true apps, as they are really just eBusinessCards. 5 years ago these were pretty cool, but the bar is rising rapidly for what clients expect when they download an app. Think about it...in the world of Uber, Facebook, Instagram, etc.. you really need to provide something unique for someone to download and actually use an app. It’s not just about downloading an app…..clients actually have to value and use it or they’ll just delete it. It’s no wonder that roughly ⅓ of all apps are downloaded and used only once. So let’s look at what the difference is and then I’ve got a few questions you can ask yourself if you’re in the market for a practice app. To summarize the difference, check out this screen shot from a web browser. 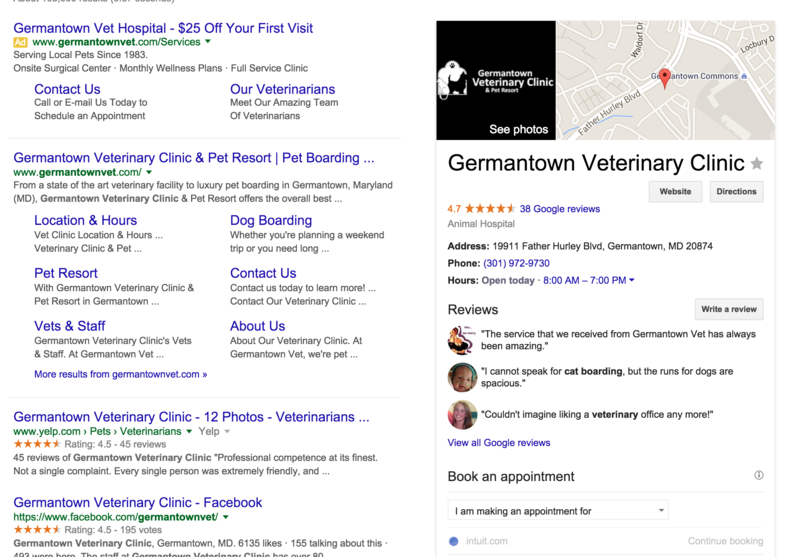 I typed in the name of a local veterinary clinic into the search bar and this is what came up. See that huge rectangular area on the right side? That’s “real estate” that is owned by Google, and it has your hours, phone number, website, a few pictures, and some reviews. In certain cases it also allows clients to email you for an appointment. All of this is already out there, free to anyone who wants to learn more about your practice, and is available on both desktop and smartphones. So why would a practice pay a few hundred dollars a month for an “app” that doesn’t offer significantly more info than I can already find on Google? That is the difference between an eBusinessCard and an app. A modern app actually has functionality. What’s your percentage of MAU (monthly active users)? This is a good indicator of user engagement: how many users are active at least once a month. For some perspective, Facebook’s is about 65%. On the other hand, I know of a couple of well-known “portal” type services in use by veterinary practices where this number is below 1%. Do you get appointments through it? Not CAN you get appointments….DO you? What’s your ROI (return on investment)? Does it do anything I can’t get for free on Google?